Most of us at OVERDRIVE love the Honda Jazz. It is big on space, has an enthusiastic engine and surprisingly good driving dynamics for its size and space. At the Auto Expo, Honda made it clear that there was a new Jazz coming and from what we saw there and drove in Japan, it looked like it would be a better car overall. Today we got our hands on the India-spec model though, so read on to know what our first impressions are. Let us begin with the space. The car is now longer than the outgoing model in length and wheelbase, so what you get is a larger cabin and a wider distance between the two rows of seats. The fuel tank has been repositioned as well, so the result is more headroom, knee room, foot space and the ability to stretch your legs further. The shoulder room has improved as well and three grown-ups can sit at the back, albeit not in utmost comfort. As we told you earlier, the rear seat can be reclined by a few degrees and that makes a lot of difference. But it is a function that won't be available on all the trims. In fact, it will be available only with the Magic Seats which can also be tumbled for better cargo room. The rear seats have a comfortable cushioning but the integrated headrests are rather small and I have my doubts on their level of whiplash protection in case of a rear end collision. The front seats are wide like in the City and the contouring is decent. We would have preferred them to be slightly deeper for times when you want to push the car around the bends. The dashboard fascia will remind you of the City too with a similar layout and equipment. 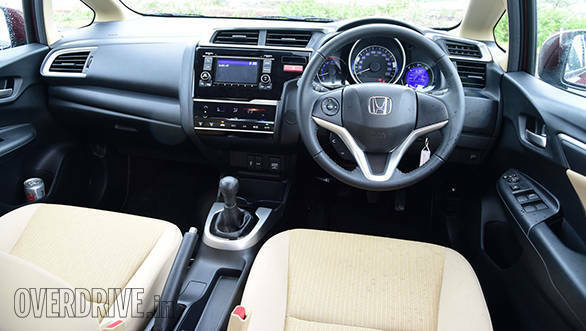 The instrumentation is familiar too with a three-pot layout and the Honda-typical tell tale lights with the Eco indicator to indicate the optimum driving speed and rev range. The controls around the centre console are minimalistic. Just like the car we drove in Japan, it gets the same touch panel for the HVAC controls as the City. Honda is offering two colour schemes for the interiors - black and beige, and all-black. The latter looks sportier and isn't prone to getting soiled as easily as the beige. If you have driven any of the newer Honda cars, you will know what I'm talking about. Despite the sharp rake of the windshield, the black dashboard doesn't make its reflections prominent on the glass surface and thus, doesn't hamper visibility. Speaking of visibility, the greenhouse on the new Jazz is generous and getting a view of the surroundings isn't a problem. I particularly like the quarter-glass on the A-pillar. The range topping cars give you a kit that includes a touchscreen infotainment system with sat-nav, Bluetooth telephony and video playback. You also get a reverse camera with three different angles for more precise manoeuvring. But since the camera is a function of the top spec infotainment system, we aren't sure if the lower trims will ship parking sensors or not. But what I don't like, is the empty panel next to the steering wheel for what should have been a push button starter. Even a Hyundai Grand i10 gets it! So if you are the kind who doesn't like dysfunctional knobs in the car, then this panel will be an eyesore. It is probably there because Honda is sharing the dashboards for the City and Jazz. But to sum it up, the cabin, though not as top notch as the Hyundai Elite i20, still manages to look and feel decent. It is typical JDM, and if you are a fanboy, you will love this cabin. There is plenty of space for your aftermarket gauges, gadgets and toys. In fact, the 2015 Honda Jazz is a modder's toy. It is one of the most widely used hatchbacks in the Asian region for spruced up interiors, body kits, engine tunes and outrageous in-car entertainment mods. It has a healthy mix of engines and hybrid powertrains on offer, but India will only get certain, tax-friendly petrol and diesel engines. The engine options are similar to that of the Amaze (a 1.2-litre petrol and 1.5-litre diesel) and there are two manual gearboxes and one automatic on offer. The oiler doesn't feel very eager, but refinement levels have improved over its stablemates. The mid range grunt is decent but tends to lose breath in the higher revs, necessitating frequent shifts depending on the driving cycle. The 90PS petrol is still the more eager and the manual feels better. There is a CVT option too, but the new gearbox has minimised the rubber-band effect and has a more linear power and torque delivery. Fuel efficiency is of a very high order with the petrol manual trim claiming 18.7kmpl while the petrol CVT delivers 19.0kmpl. The diesel claims a lofty fuel efficiency of 27.3kmpl. Compared to the Amaze, the Jazz is a larger car and follows a completely different design language. 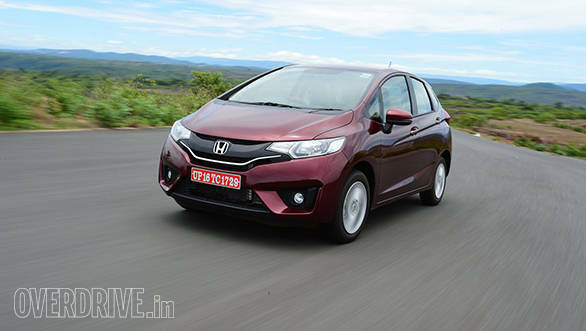 It doesn't look innocent like the previous Jazz and instead it wears the sharper style seen on the new Honda City. The most striking design element is the prominent shoulder line, which despite its depth, is hard to notice on the lighter colours, but looks great on the darker shades. The headlamps are almost similar in shape to those on the City, but have a single barrel configuration. The top spec trims come with fog lamps as well but miss out on the LED DRLs sold on the global Jazz. The face looks very similar to the City at first glance but you will notice that the bonnet is way smaller and has a sharper slope. 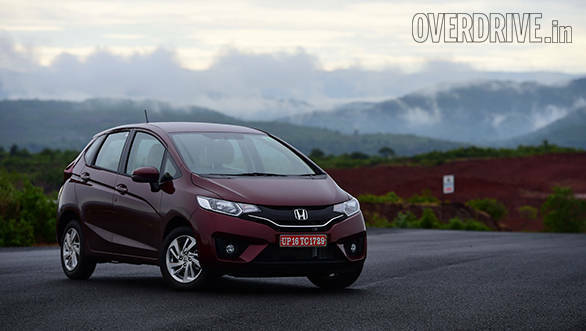 The roof, windshield and bonnet form an arc and give the Jazz a single-box silhouette. 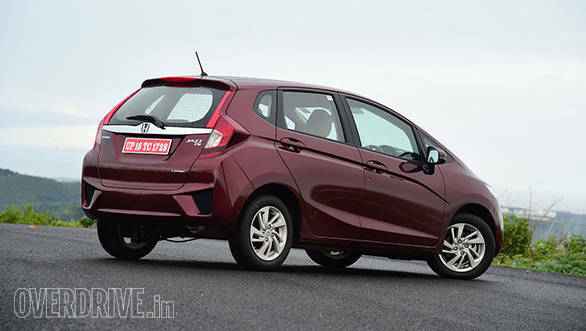 The Jazz comes with two wheel size options depending on the trim level and has a completely new alloy wheel design. It looks unique and sporty but you know it's a Honda when you look at the Amaze and City in the same showroom. The tailgate is one of the best in class with chunky LED lights and adjoining reflective elements between the C-pillar and the windshield to give it a seamless design. It will remind you of the Honda CR-V. The loading lip for the boot is quite low, perhaps the best in class. The lid also opens generously high to provide access to the huge boot. A downer is that the parcel tray doesn't come with suspenders and therefore needs to be folded up manually. Ingress and egress is very easy and the rear seats, though lower than the outgoing Jazz, won't be difficult to get in and out of. The ride quality is very good too and even surpasses the Hyundai Elite i20. The suspension is a little noisy, but doesn't overwhelm you with crashing sounds. Long distance journeys are still going to be comfortable in the Jazz, but a rear arm rest and AC vents (especially for a cabin as big as this) would have made the journey more comfortable. 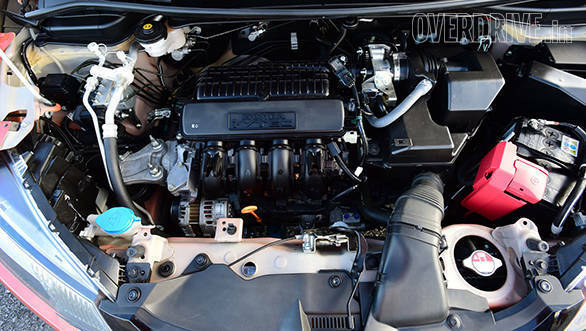 The air conditioning unit in the new-gen Jazz is a tad noisy especially at fan speed levels five and up (out of eight). Driving in the city is a breeze. The steering is well weighted and progressive. So are the brakes. Despite the cushy suspension, there is no unnerving nose dive even when coming to halt from 80kmph. The grip from the 175-section Michelin XMs is decent but 185 or 195-section rubber would have been welcome. But that would have hampered the fuel economy and not let Honda claim what could be the best in class fuel efficiency for the Jazz trims. But despite the smaller rubber, the road manners of this compact-sedan-dwarf are very good. There is body roll, but not in unnerving amounts. The ride isn't bouncy either. The handling dynamics aren't in the league of the Polo but comparable to the Swift and better than the i20. In fact, the Elite i20 and the Volkswagen Polo are the primary targets for the Jazz, which means that it won't be a cheap car to buy. 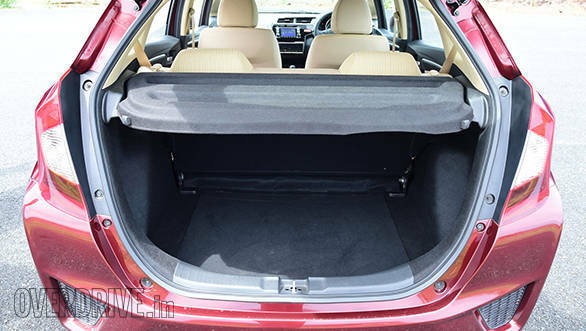 But if you think about it, it is essentially like a Honda City without a boot so you get space almost similar to the sedan, but with the convenience of a hatchback. To me it makes more sense than the crop of compact sedans out there and if you don't necessarily need the 500-odd litre boot space, then it may even serve as an alternative to most mid-size sedans. And in that sense, the Jazz continues to make a very strong case for itself.